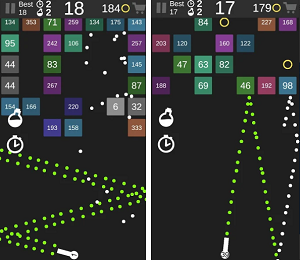 For players that enjoy testing their fast reactions by playing simple tap games on their smartphones it can be hard to choose the right game among so many of these games offered. Traffic Raffle is an amazing tap game where not only you can have fun tapping and testing your tap skills but also you can enter tap competitions and try to get the highest scores to win prizes. That’s why we pronounced it our Tap Game of the Month. Developed for android and IOS users, this competition game with a simple and fun tap tap gameplay offers you the chance to have fun playing a game while competition for amazing prizes. The player has a task to enter a competition and try to tap the green traffic light as much as possible to get high scores. The yellow light you need to avoid because will freeze your scores for a few seconds and the red light does not bring you scores. Use your limited time to tap the green light as much times as you can. The Traffic Raffle gives players the chance to try out 2 different modes. Players can try the competitive mode where they have the chance to enter competitions and try to win the highest scores to get some of the amazing prizes offered. Tap fast to get as high scores as possible. Players with the practise mode get a chance to put their tap skills on test and practise before entering any competition. Prizes like gift cards, phones and many more prizes are offered for the best players in each competition. To enter any of the competitions you just need to sign up. Just keep tapping continuously when the traffic light is green. More you tap, more scores. Stop tapping when the traffic light is yellow or red. Rank high among other players and try to be one of the 3 best tappers in each competition to win one of the amazing prizes. When the competition ends, claim your prize.